Recently Updated Baldwin Park home. 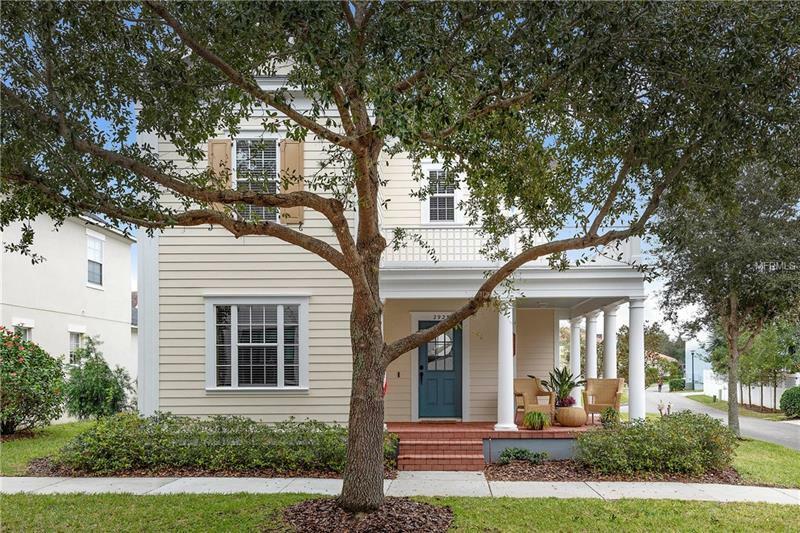 The inviting exterior begins with a wrap-around front porch accented by pavers and nestled on an unparalleled oversize corner lot with scenic views of Lake Baldwin Greenbelt. The attention to detail continues with lovely upgrades throughout the home. Downstairs welcomes you with Crown molding and 5 1/4" baseboards. Powder room is dressed with new quartz counters & glass sink. The generous kitchen overlooks the family room and is outfitted with 42" upper cabinets, striking granite counters, stainless appliances, office/buffet, wine fridge, and even an oversize island with bar seating perfect for entertaining. Storage has been carefully designed with large double door pantry & enormous wrap around closet under the staircase. Three bedrooms and two updated baths complete the upstairs. The upstairs master suite features a recessed ceiling, sizable walk-in closet, spacious updated master bath offering dual sinks with quartz counter top, a glass encased walk-in shower & garden tub. The covered paver back porch is the perfect place to enjoy a glass of wine or read in the shade while a large paver patio offers the outdoor chef a perfect place to grill & entertain. Baldwin Park offers endless amenities - Top-rated schools, 3 community pools, 2 fitness centers, several playgrounds, walking/biking trails, Publix, shopping, restaurants, and underground utilities with Lake Baldwin dog park only a short distance away. Minutes to Downtown Orlando & Winter Parkâs famed Park Ave.